Imagine watching your favorite television shows, major motion pictures, and home movies on a screen that's double or triple the size of your television. Why imagine it when you can live it? Simply turn to Titan Home Technologies, a proud provider of home theater projectors in Tampa. These screens are known to produce clear, crisp images better than home theater televisions with similar specifications. The enormous size, picture clarity, and sharpness aren't the only factors that make home theater projectors so desirable. Other reasons people choose projector screens over TVs include user friendliness, brightness, and easier on the eyes. A custom home theater is a worthwhile investment, as it will increase your home's value and make movie-watching better than ever before. If you're installing a home theater, take your design to the next level with one of our home theater projector screens. At our company, we offer the most state-of-the-art options available from trusted brands, so you can feel confident that you'll receive the highest quality home theater equipment available. As an added bonus, we're committed to giving you the greatest prices possible. Why spend more at a large, chain retailer when you can save money by turning to our locally owned business? Until recently, most homeowners who wanted to watch a major motion picture had to do so by spending money at the local movie theater, or crowd around a television in the living room. The days of sitting shoulder-to-shoulder in a crowded room are long gone. 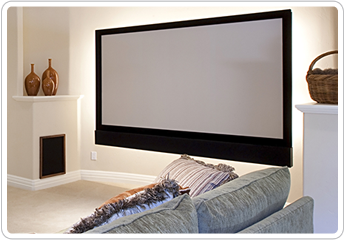 Simply have our reputable company install one of our top-of-the-line projector screens in your home theater. This allows you to enjoy a movie-going experience without sacrificing your comfort. You can turn family movie night into a true cinematic experience, as projector screens allow you to watch your favorite movies in larger-than-life proportions. Watching movies and television shows and playing video games has never been a more exciting experience when you have one of our home theater projectors installed. These screens allow you, the viewer, to see every intricate detail of the game or movie, as you would see it in real life. Once you've committed to installing a home theater, you need the right company to do the job. Our experts, backed by almost 20 years of experience, have the knowledge needed to do the job right the first time. As an added bonus, you never have to worry about us cutting corners to do the job done. In fact, our team will go the extra mile to ensure we adhere to the industry's current installation practices to ensure a job well-done. Make movie watching and gaming an experience unlike any other with one of our home theater projectors. Contact us today to schedule an installation. Our services are available for customers throughout Tampa, Florida, and the surrounding areas.